Kadai Swami of Jaffna: "Lord of the Grand Bazaar, of appearance holy, though of a crank." Nallur is an ancient city in Jaffna hallowed by the sacred foot prints of holy beings, jñānis and siddhas. From the 18th Century onward we are able to trace four sages whose presence added to the sanctity and glory of the Nallur Kandasamy Temple. Kadai Swami of Jaffna, honoured as a siddhar, was known earlier known as Swami Muktananda in the state of Karnataka, India. He came to Jaffna in 1860 invited by Vairamuttu Chettiar of Nallur. As he was seen mostly at Periya Kadai (Jaffna bazaar) he was called Kadai Swami. He frequented the Nallur temple surroundings often. Chellappah then a young novice, recognized Kadai Swami's spiritual stature. They were drawn to each other mutually and Chellappah was blessed by Kadai Swami. Kadai Swami's inclination was towards the tantric path. He did not discriminate anyone on the basis of caste or creed and visited their homes unreservedly; they served him with their usual fare of toddy, fish and meat all of which he accepted with an attitude of dispassion. This upset the feelings of some orthodox Saivites devoted to him. He attained Mahasamadhi in 1891. Nallur Theradi Chellappa Swami (1840-1915) was the jñāni who greatly enhanced the sanctity of Nallur. As he spent most of the time reposing on the steps of theradi where the Nallur temple chariot is kept he was known as Theradi Chellappar. Chellappah's parents from Vattukodai, settled in Nallur to cultivate their lush fertile fields. Chellappah was educated at Jaffna Central College and later joined Jaffna Kachcheri as an arachcii. Very soon ascetic inclination overwhelmed his mind. Though outwardly he carried on his normal work, inwardly he was soaring high spiritually. During this phase he was also blessed by Kadai Swami who frequented the Nallur Temple precints. When the midnight puja was over and all had left he would hurry to the entrance of the Kandaswami Temple. Intoxicated with divine fervor in mystic communion he would call out to Lord Murugan of Nallur, "Appa! Appa!" He appeared outwardly like a mad man; like one possessed by spirits; like an innocent child. To the masses he was a madman Visar Chellappa. To confirm Himself to the guise of a madman, he behaved more and more erratically. Many supernatural powers siddhis manifested in him but he openly declared "Chellappah will not exhibit any such powers; he will be known as a mad man to the world and quit away." The earnest seekers, his devotees identified him as a great spiritual being, they felt sad seeing his radiant face crowned with uncombed hay like hair and his thin wiry body wrapped in filthy rags. 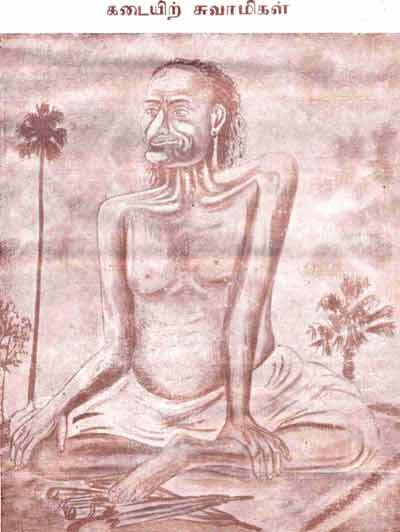 Siva Yogawami (1872-1964) was no exception to the mystic magnetic pull of Nallur. He was born at Mavidapuram to Ambalavanar and Sinnachi Ammaiyar on 29.05.1872. He was named Sathasivam and later came to be known as Yoganathan. He was educated at St. Patrick College, Jaffna. He was employed as a store keeper at Killinochi for some time. From his early youth he was devoted to Nallur Kandaswami. Every weekend he would walk all the distance of 40 miles from Killinochi to Nallur. He composed several devotional songs praising Nallur Murugan and his Sat Guru which has been recorded in Natchintanai (Songs and Sayings of Yogaswami). He sang, "At Nallur where the holy and the wise meet, He made me his own and showed me the way of bliss. He rescued me from the pangs of birth and death". Life for Yoganathan, after meeting his Sat Guru became one of intense spiritual discipline, severe austerity and stern trials. One day in 1910 Chellappah Swami made Yoganathan and Kathirveluswami to sit side by side in meditation for about forty days on the steps of the theradi. Later on Chellappah under the shade of the vilva tree beside the theradi greeted Yoganathan with significant words. "You alone are worthy of being crowned by me. Come! Come! Thine be Lankapuri, I give! I give! The crown of kingship, to Thee! to Thee! as long as the universe endures and the waters of the oceans perish not." 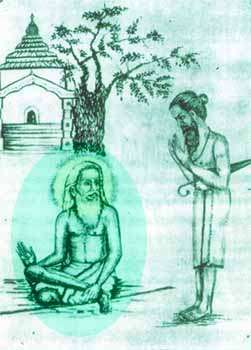 By the grace of the Guru, Yogaswami blossomed into a poorana saint. Finally the Sat Guru ordered Him to fend for himself. He immersed himself in tapas under the illupai tree at Columbuthurai junction and later he settled down in a hut at Columbuthurai. The Maha Vakyas which flashed spontaneously from Sat Guru Chellappah Swami were picked up by Yogaswami and perpetuated. Eppavo mudintha kariyam - Accomplished is His will. Nam ariyom - We do not know. Muluvathum Unmai - All that is, is Truth Absolute. These are to us are like the Upanishad truths culled from the Vedas and the truths propounded by the sages Thirumular, Thaiyumanavar and those of their lineage. Siva Yogaswami lived as the walking expression of grace, an unfailing refuge to souls in distress. 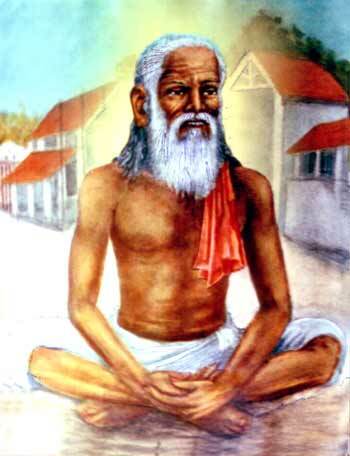 He attained Mahasamadhi at the age of 92 on 23.03.1964. His ashes are enshrined in the Columbuthurai Ashram every ayilium natchatharam his Guru Puja is observed. Siva Yogaswami's glory spread from Jaffna to all corners of the world. Vimala Krishnapillai, a retired lecturer at Colombo University, has been an admirer and follower of Yoga Swami since the early 1950s.